Welcome to the Q&A forum, a place for new and old members alike to ask any questions about BZPower, its rules, and its traditions. We, the Q&A staff, do ask that you please search through this topic before posting your question, as it serves as a compilation of basic information and frequently asked questions. Below is an outline of all of the headers and sub-sections found in this topic. Clicking on a header will bring you to the post that contains that section. You may also use the search or find function of your browser to search for a specific term. How Do I Make a Blog Entry? What Is the Calendar Used for? How Can I Access the Calendar? Why Should I Report News? What Do the Coloured Icons Next to the Reports Mean? What and How Can I Report? Am I Rewarded for Reporting News? I've Sent My Report, but I Didn't Get a Response! Is That Right? Why Didn't My News Get Posted? I Have Been Reporting News Several Times, and I Am Still out of Luck! Official Pictures Topic -- All image-related questions go here. Official Proto Energy Topic -- All questions about Proto go here. 11/18/2015: Added info about the new "more" tag in this section. 02/07/2015: Updated the section on post count, since posts now increase in G&T and Q&A. 12/30/2014: Added link to the Policy Change Reference Topic. 07/22/2014: Minor changes: profile image updated, Referred Members info added, Tracker info updated. Edited by -Windrider-, Feb 06 2016 - 12:36 PM. BioniLUG Discussion - for BioniLUG members only. Please note that the following icons are for the "IP.Board" skin; however, we have included the "BZPower" skin equivalents in parentheses next to them for reference and comparison. Marks a forum or forum group that contains new, unread posts. Clicking on this icon will mark all unread posts in that forum or area as read. Marks a forum or forum group that contains no new or unread posts. ( ) Indicates that there are new, unread posts in the topic. Click on this to be taken to the first unread post in the topic. ( ) Indicates a hot topic topic (containing 24 or more replies). ( ) Indicates that the topic includes a poll. ( ) Indicates an important topic of the forum. These topics remain at the top of a forum's page and are exempt from revival. ( ) Indicates a topic you have posted in with no new posts. ( ) Indicates a topic you have posted in with new, unread posts. Click on this to be taken to the first unread post in the topic. ( ) Next to this icon you can see which tags have been used to describe the topic. Click on any one of them to perform a search for topics with that same tag. ( ) Indicates a topic that has been locked; normal members can no longer post or edit a post in these topics. ( ) Indicates a topic that has been moved to another forum. Clicking on this topic will direct you to the topic in the new forum. Edited by -Windrider-, Dec 03 2015 - 06:29 PM. "Topic Title": This is a required field. Simply put, this is what your topic will be titled. Note that consecutive capital letters will be made lowercase, and the first letter of each word in the title will be made uppercase. However, in most cases, a Forum Leader should be able to fix these automatic corrections, so feel free to report the topic and request that the title be changed. "Topic Tags": You are allowed up to five tags, separated by commas, with which you want to identify the topic. Any member who clicks on one of these tags will trigger a search for topics with a similar tag. Starting a new poll in the non-Creative, LEGO- or BZPower-related forums is a perk available to all BZPower members. While starting a new topic in these forums, look for a "Manage Topic Poll" option in the upper right-hand corner. "Poll Title": Simply, what you wish to title your poll. "Make votes public? ": "If checked, member votes will be made public. (This cannot be changed once a vote has been made!)" Checking this will allow members to see a list of who voted for which option. "Question 1": You may have up to three questions per poll, with ten choices per question. Click "Add Another Question" to add an additional question; click "Add Another Choice" to add another poll option for that question. "Allow multiple choice? ": Select this if you wish to allow members to select more than one response for a question. This may be toggled differently for each question. Questions allowing multiple choice will display square check boxes; questions allowing only one choice will display circles. "Enable signature? ": Uncheck this to prevent your signature from appearing below your post. More on signatures to come. "Follow this topic? ": Check this if you wish to receive a notification when another member posts in the topic. You will also find a "Follow this topic" button in the upper right-hand corner of a topic's page that you may use. More on notifications can be found here. This option is available to BZPower's Premier Members. This allows you to attach media files to a post that other members may download. The new IPB software uses a rich text editor for posting as a default. You may, however, still type in BBCode tags. To switch from the rich text editor to the BBCode view, click on the "light switch" ( ) in the upper left-hand corner. In this mode, you can type in your tags manually, or view and edit the tags you have added by formatting in the rich text editor. You may also type out BBCode in the rich text editor, and then click on the "light switch" twice to see the results.Below, we will be covering the basics for formatting your posts. We will describe how to use the rich text editor and provide the corresponding BBCode tags. Bold Text: Highlight/select the text you want to bold, then click on the button. Italic Text: Highlight/select the text you want to make italic, then click on the button. Font Color: Click to select a color you want. Advanced users may use any color hex code with the BBCode tags. Images: Click and paste in the URL of your desired image as prompted. All images posted on BZPower must be less than 750 kB in file size. See the Pictures Topic for more information. The above is an example of a post by yours truly. The numbers in red correspond to important aspects and features that will be covered below. 1. Post Content: This is, quite simply, the content of the member's post. All posted content must follow the BZPower Rules & Guidelines and is subject to moderation by the forum staff should it not. 2. Post Number (Linking to a Post): This is the ordinal number of the post in the topic. Clicking on this will generate the post's URL in your browser, which you may then copy to your clipboard. 3. Display Name: This is the display name of the member who made the post. Hovering over this will pull up at-a-glance information about the member, such as his or her join date, whether or not he or she is online, and his or her time of last activity. (Note: Last Active Private means this member has chosen to sign in anonymously. )Click on the member's display name to go to his or her profile page. 5. Avatar: This is the image with which the member has chosen to identify. Your avatar is a cropped selection of the personal photo that appears on your profile page. Please note that while animated .gifs will animate as a personal photo, the corresponding avatar as seen as thumbnails on the boards or in topics will not.To change your avatar and personal photo, click here. Select "Change your photo..." and follow the prompts. Avatars of any dimensions should upload properly after the November 2nd software update; no longer should you need to insure it is larger than 200x200 pixels. After uploading a photo, you will be asked to crop it. The cropped selection will appear as your avatar; the uncropped image will appear as your personal photo on your profile page.For more information, please see the Pictures Topic. 6. Member Group: The group that this member belongs to, displayed in its corresponding color. For more information, please see the "Member Groups" section. 7. Member Title or Post Rank: Unless given a special title by the administration, a member's title will correspond to his or her post rank, which changes according to how many posts he or she has made. These ranks are kept a secret! The title "Senior Staff" is given to staff members who have been on the team for three years and longer. 8. Rank Image: This image corresponds to a member's post rank and will be displayed for Premier Members only. The post rank and rank image correspond to how many counted posts a member has made. Forum Administrators get a special rank image of four golden gears; BZPower Administrators get six. BioniLUG Discussion: Hm, don't have an explanation for this one! Perhaps out of fairness to non-BioniLUG members. Completely Off-Topic: BZPower is a LEGO-related forum. We love COT; we really do - but we don't want every single post to wind up in there. Off-Topic Culture: See above about off-topic discussion! 12 years: Furno or something? Maybe? 14 years: Gali's mask, Gen 2 style. 11. Proto Bar: BZPower uses a merit/demerit system known as Proto Energy (PE). The Proto Bar beneath a member's post count is a visual representation of his or her standing in the system. Each member starts out with a half-full bar, or neutral Proto. This corresponds to a level of "0." Each point of Proto lost subtracts one point from the level, down to "-5," or an empty Proto bar, and each point of Proto gained adds one point to the level, up to "+5," or a full Proto bar. Administrators, Global Moderators, and Forum Leaders (within their assigned forums) have the ability to alter a member's PE. Should a member reach full Proto, and should he or she notify a Forum Assistant, he or she will be placed in the Outstanding BZPower Citizens group. Aside from purchasing Premier Membership, there is no guaranteed way to earn Proto! It varies from moderator to moderator, but it helps to display your best to them in whichever forums you frequent. Even if your Proto bar remains half-full, this is fine; it means you have done nothing wrong. See the Official Proto Energy Topic should you have any questions, or just for more information. The total dimensions of your signature must not exceed 800x300 pixels. There is a reference box included on the signature edit page. You are allowed up to 10 images that must collectively fit within the 800x300 dimensions. Allowed file types are JPG, GIF, PNG, and SWF (Flash animations). The filesize of all of the images in your signature and your avatar, when combined, must not exceed 100 kilobytes (kB). Your signature is subject to BZPower's global Rules and Guidelines as well. Should a member's signature violate these guidelines, it will be removed and the member will be directed to the topic containing the guidelines. 14. "Report": Use this link to report the post should it be in need of review by the forum staff. More on reporting can be found here. 15. "Blog This": Using this link, a Premier Member can create a blog entry containing the content of the post, including a link to the topic. 16. "Edit": This simply allows the member to edit his or her post, or a Forum Leader (within his or her assigned forums), Global Moderator, or Administrator to edit the post. 17. Quote Tools: Click "Quote" to generate the code for a timestamped quote of the post in the reply field at the bottom of the topic. Use "MultiQuote" to select more than one post to quote. marks a user who is offline or signed in anonymously. 19. Post Reputation: Added February 9th, 2014. This number displays how many members have "Liked" the post. Content is Likeable on the Forums, in the Blogs, in the Calendar, and in the Gallery. Names are not attached to the Likes, and negative Reputation is currently disabled. Furthermore, members are unable to Like their own content. To the left of the Reputation number of content you haven't posted, however, you will find an arrow button, . Click this to "Like" the post. Members are currently unable to "Unlike" content they have already supported. Not Shown Here: If you hover your cursor over a member's signature, you should notice an appear in the upper right-hand corner. Click on this to be given two options: "Ignore [the member's] Signature" and "Ignore All Signatures." Selecting "Ignore [this member's] Signature" will cause that member's signature not to be shown in topics. Selecting "Ignore All Signatures" will have no signatures be shown in topics. You can also set these ignore preferences up in your Control Panel. You cannot individually ignore the signatures of Global Moderators, Blog Leaders, Forum Administrators, and BZPower Administrators using the , nor can you do it through the Control Panel. Edited by -Windrider-, Jul 20 2015 - 02:18 AM. Above is an example profile page. The profile page is accessible by clicking on a member's display name or avatar in the active users list or in a topic. 1. Personal Photo/Avatar: This is the photo with which the member has chosen to identify him or herself. When viewing your own profile, you can change this photo by clicking the "Change" button that appears in the top left. 2. Last Activity: This line displays the date and time of the member's last activity on BZPower. At the left is the online/offline indicator. Unless a member chooses to sign in anonymously, the online indicator will be active whenever the member is browsing BZPower. If a member is signed in anonymously, the offline indicator will appear and the "Last Active" line will read "Private." 3. Member Rating: Members can rate other users one to five stars using this graphic. Please do keep in mind that, ultimately, your rating is meaningless, as you neither gain nor lose anything based on your current rating. Members cannot rate themselves. 4. Status Update: This displays the latest status update that the member has made. You can update your status through the "Profile Feed" tab on your profile page or using the drop-down menu accessed by clicking your name in the forum header (top right). 5. "Edit my Profile" Button: This button appears on your own profile page; click it to access the Profile Settings tab of your User CP. More information is provided in the "Control Panel" section below. 6. Options Bar: The buttons displayed here depend on whose profile you are currently viewing. While viewing your own profile, only the "Find Content" button is displayed - this allows you to perform a search for your own topics, posts, etc. This button displayed on the profiles of other members as well, along with a "Send me a message" button and one allowing you to add or remove the member as a friend. 7. Warning Points and PE: No longer displayed. Members' Proto bars are now displayed here on their profile pages, however. 8. Tabs: The "Overview" tab is active by default when opening a member's profile page and is displayed above. The "Profile Feed" tab displays a list of the member's status updates. The "Friends" tab provides a list of all the member's friends; "Topics" and "Posts" list the last five topics and posts the member has made, respectively; the "Blog" tab displays previews of the member's last five blog entries, if applicable; and, the "Gallery" tab will display the member's albums and images. New additions are the "Reputation" tab, which displays your content that people have liked, and the "Issues" tab, which shows any Tracker tickets you have started. 9. "About Me" Section: A little blurb written by the member. Contents vary wildly, from the boring (mine) to the GIFy (Sumiki's?!). Go here to edit yours! 10. "User Tools": This block allows you to view a member's display name history. That's about it! 11. "Community Stats": I believe the image above explains it all, but it is good to note that the "Gender," "Birthday" (and consequently "Age"), "Location," and "Interests" fields are entirely optional. 12. "Friends": If the corresponding options are enabled here, this block will show a selection of twelve of the member's friends. 13. "Latest Visitors": If the corresponding options are enabled here, this block will show the latest five members who visited your profile page. Visits made by members who have signed in anonymously will not appear. Not Shown Here: When viewing another member's profile, you will find a "Report This Member" button in the bottom right-hand corner of the page. This button has a number of purposes, so please read up in the "Reporting on BZPower" section. The User CP, or "My Settings," is the core of your personal settings on BZPower. In the CP, you can manage your personal messages, blog, profile information, photo, and many other things.To enter your control panel, click on your username on the right side of the black bar lining the top of the forums, and select "My Settings." Or, simply click here. The "General Account Settings" area is the first page you will see when you enter the Control Panel. From here, you can change your photo and select your time zone.This is also where you manage the content that appears on your profile page. You can choose to allow people to comment on your page in the "Profile Feed" section, and select whether or not you wish to be approve them before they are displayed. In this section of the Control Panel, you can change your email address and password. Please note that if you change your email address, you will be placed in the "Awaiting Authorization" group until an administrator re-approves your account. Here you can change your BZPower display name, your publicly visible username. This will not, however, change the name you use to log into the forums.The frequency with which you can change your display name depends on your member group. Regular members can change their name after ninety days; Premier Members can change it after forty-five days; Outstanding BZPower Citizens and Retired Staff can change their display name after thirty days. Staff members cannot change their own names. Here, you can change your signature, which appears beneath each of your posts unless you choose to not have it appear in the posting window. Signatures may be edited using either the rich text editor or BBCode.Don't forget to check your signature against the Signature Guidelines. The reference box in the signature preview area can be used to check your signature's dimensions, which must be no more than 800x300 pixels. This is where you can manage the members that you ignore in the forums and select what content of theirs you wish to hide. You can hide individual members' signatures, hide their entire posts, and block them from sending you personal messages. You can also choose not to view any signatures while viewing the forums. You cannot ignore Global Moderators, Blog Leaders, Forum Administrators, or BZPower Administrators. In the "Manage Attachments" tab, you can see the files that you have uploaded to BZPower. For each item, you can find its name, file size, number of downloads, and the topic in which you attached it. You can also delete files you have attached from here. Please note that uploading and attaching files is a Premier Member perk. There are two tabs in the Settings area that deal with board notifications, previously known as subscriptions. You can reach either of these tabs through your Control Panel or through the notifications tab in the black bar at the top of the forum, to the left of your username. The first Control Panel tab, "Notification Options," is where you can customize the methods through which the board sends you notifications. For each example of content you want to be notified of, you can have the board send you emails, send mobile app notices, or add items on your notifications list. You can select any combination of these notifications. You can also select how often you want the board to send you notifications: they can be sent immediately, only when you are offline, or as a daily/weekly digest. If you choose to have notifications added to your list, they will appear in the "Your Notifications" tab in the Control Panel. Here, a list of past notifications will appear, which you can read and delete. Your Messenger is where you can read, send, and manage your PMs, or "conversations," as the board now describes them. It can be accessed by clicking on your username on the right side of the black bar lining the top of the forums, and selecting "Personal Messenger." The personal messenger can be disabled using the "Disable Messenger" button in the messenger's left column; however, this is not recommended. Regular members can hold up to 200 PMs in their messenger, and Premier Members can hold up to 1000 PMs. If a member's Premier Membership ends while he or she has over 200 PMs, the excess PMs will not be deleted, but the user will have to delete conversations until there is fewer than 200 PMs remaining before he or she can receive new PMs. The personal messenger allows members to communicate in private; however, all BZPower rules still apply to PMs. Administrators can read PM conversations in two situations: when a PM is reported by a member using the report button beneath a message, or when they change a member's password. The latter method is used only in extreme circumstances. New PMs are added to the "New" folder automatically. After being read, they are moved to the "My Conversations" folder. You can then move the message to other folders, which can be customized using the "Edit" and "Add" links in the folder list on the left side of the messenger. You can archive individual conversations using the "Archive Conversation" link at the bottom of the conversation. This will send a copy of the conversation to your registered email address. You can begin a new PM conversation from several locations. You can use the "Compose New" link in the upper right corner of the messenger, in which case you will need to input the display name of the member you wish to contact. There is also a "Compose New" link in the messenger dropdown in the black bar at the top of the forum. You can begin a conversation with a specific member by using the "Send Message" link in their profile card, which can be accessed by hovering your cursor over their username in most areas of the forum, or by using the "Send me a message" link on their profile page. The "Participants" list to the left of a PM conversation names the members involved in the conversation. These members can each read the last time the other participant read the PM and can block the other member from sending them messages. There is also a link that toggles whether or not you will receive notifications for the conversation; this setting applies only to the conversation in which it is changed. Note that, in order to preëmptively reduce spam, you may only start a conversation with one other member at a time. As of December 16th, 2012, however, Premier Members are able to add up to to 10 people to a conversation. You can manage the users on your friends list by clicking on your username in the black bar at the top of the forums and selecting "Manage Friends." Here, there will be a list of the users on your friends list. For each user, there will be a set of buttons which you can use to remove them as your friend, send them a personal message, view their content, and read their blog (if available). Your content can be accessed by clicking on your username in the black bar at the top of the forums and selecting "My Content." In this section, your content is divided first by content type: forum content, members content, calendar content, and blog content. It is then organized more specifically depending on what type of content you are viewing. For example, your forum content can be viewed as the topics and posts you have made, only the topics you have started, or the posts you have made. The Members content is a list of comments you have made in other users' profiles. Your blog content can be set to show the blog entries you have posted or comments. The content you follow can be viewed by clicking on your username in the black bar at the top of the forums and selecting "Content I Follow." The content you follow, like the list of your content, is categorized by the type of content. Forum content is divided into forums and topics and blog content is divided into blogs and entries. Above the list of followed content is a "Toggle Edit Options" button, which reveals the controls you can use to manage the content. Once you have toggled the controls, the time at which you receive notifications will appear beneath the names of the followed content. If you are following something anonymously, this will also be noted. Using the check boxes and selection list, you can change various settings related to the followed content or stop following it entirely. A new feature! Well, an old one brought back. Store anything here! Edited by -Windrider-, Feb 21 2015 - 03:36 PM. Spam is an acronym for "Stupid, Pointless, Annoying Message." It refers to posts and comments that have nothing to do whatsoever with the discussion going on in a particular topic. It doesn’t matter if the post is very short or very long (there is no word limit for a post), or if the grammar isn’t perfect - as long as it relates to the discussion at hand, it isn’t spam.An example of spam would be a post saying "I like cake!" in a topic that is asking about your favorite Toa. In the creative forums, generic posts count as spam. A generic post is, simply put, a post that could have been made without the author's ever having looked at or read the creation. For example, a review stating only, "This is very good! I like it a whole bunch!" is generic, and therefore spam. A review needs to be specific to the creation posted. If you do encounter a spam post, please report it and it will either be deleted or a message will be edited in by the staff. Flaming occurs when someone posts a comment simply to insult a person or group. Respect and courtesy is expected of all BZPower members.Trolling is a similar phenomenon, and is when a person tries to provoke others into arguing. It is also not allowed on BZPower, and all such posts will be deleted. Please note that simply disagreeing with a member, provided it is done courteously, is not considered trolling. Trolling is also distinct from the more common instances of sarcasm and simply joking. Topic revival occurs when someone posts in a topic that has not received a post in 60 days. A list of the revival limits for each forum can be found in the BZPower Forum Revival Reference, and also in the rules topic of each individual forum. Some forums are exempt from revival, namely the Library forums (Epics, Short Stories, and Comedies), BZPower Q&A, Comics, and the BionicleSector01 forum. Any and all pinned topics and topics with the designation "Official" in their title are also exempt from revival. If you come across a topic that has been revived, do not post there. Instead, please report the offending post. Leet is a manner of typing where letters are replaced with numbers and other symbols. Since leet can be confusing and is difficult and annoying to read, its excessive use is prohibited on BZPower.Please see the BZPower Language Use Guidelines for more information. A point worth noting is that spoiler tags are to be used only for spoilers, and not as a way to decorate your post or some such. Please read the spoiler section in the Storyline & Theories Forum Rules for more information. BZPower has, over the course of many years, built up a good relationship with LEGO. As such, we respect their business and adhere to their official release schedule. More specifically, BZP has a strict policy when it comes to leaked LEGO information. Essentially, any and all images that have been leaked before an official LEGO announcement are not allowed on BZPower. Images marked "preliminary" or "secret" or some such variation cannot be posted or discussed in the forum. The same is applicable to any other information obtained in this manner. For a more detailed explanation, please see the BZPower Leaked Content Policy. BZPower has a filter in place that will automatically edit any word on the list upon posting. It is possible to bypass this filter, but for obvious reasons, we aren't going to explain how. Let it be known, however, that bypassing the filter by whatever methods is strictly prohibited. While we do understand that not everyone will agree each with word's place on the list, we ask that you respect the decision of the administration to filter it nonetheless. Allusion to or minor edits of filtered words are considered a bypass of the filter as well, and you must refrain from doing either. Exceptions include variations on minor swears, such as "heck," or "darn." Other words may be considered exceptions at the discretion of the moderating team. BZPower receives a ton of new content daily, be it topics, posts, blog entries, blog comments - everything, really. The BZP staff does its best to look over all the content posted each day, but it is very difficult to be perfectly thorough with the limited numbers that we have. This is where you can help! There are a few ways to report the many different kinds of content here on BZPower. Click on the "Report" link below the post in question to bring up a new screen where you will be prompted to type in your report. To report a topic, report the first post in that topic. When a staff member receives the report, he or she will be provided with a link to the post in question and with the name of the member who made the report. Please note that this form is to be used ONLY for reporting content and is not to be used as a method of communicating with moderators for other reasons. That is what the messaging system is for. The content violates the BZPower Rules and Guidelines. The topic is a duplicate of another topic. The offending post is topic revival. You are the owner of the topic and wish to have it closed. You are the owner of the topic and wish to have the topic title edited. The topic's question has been answered. While viewing a blog entry, you will notice a button beneath the entry on the right-hand side. Use this to make the blog staff aware of a blog post that is in conflict with the Blog Rules. If you see a content block in a blog that violates the Blog or BZPower Rules, please send a PM to a Blog Assistant. A profile field that contains inappropriate content. A signature or avatar in violation of these rules. Any violating profile feed comments or status updates. Allow me to restate that last point. On the old boards, signatures and avatars were reported by PMing a Forum Assistant. No more: to report a signature or avatar, use the "Report This Member" link on the member's profile page. As with all reports, a report made using this link will include your name, so no need to worry about credit. If you have full Proto or see a member with full Proto and you have/he or she has not been placed in the Outstanding BZPower Citizens group. If you see an advertisement banner (top and bottom of the forum index) that is inappropriate for BZPower. For the last situation, please be sure to include a link to the site advertised, and a screenshot, if possible. If you receive an inappropriate Personal Message and you wish to report it, use the "Report" link that you will see at the bottom of the message while viewing it. Please note that this gives the Administration permission to read that conversation. As of July 25th, 2013, the advertising policy has been completely revised. Simply report links that violate BZP's standard Rules and Guidelines using the appropriate method (i.e. "Report" links for posts, profiles, etc.). AdvertAlert is no longer used. Edited by -Windrider-, Nov 18 2015 - 08:54 AM. BZPower members are divided up into two main groups: staff and members. These two groups branch off into their own smaller subgroups. The staff itself is divided into the administration, forum staff, blog staff, and news staff subgroups. BZPOWER ADMINISTRATORS -- They are the leaders of the site, and help to pay BZP's bills as well as managing different aspects of the forums, social media, and other areas. Forum Administrators -- Formerly Assistant Administrators. They run the forums and assist in the setting and enforcement of polic. Global Moderators -- Formerly BZP Moderators. They have all the powers Forum Leaders have, but in every forum, and more: they assist the Forum Admins in running the site, and are responsible for much behind-the-scenes enforcement, such as removing violating signatures. Forum Leaders -- Formerly Moderators. They are responsible for running the day-to-day things in the forum. Forum Leaders and above can be assigned as a primary leader of a forum, and will then be in charge of its rules and direction. Forum Assistants -- Formerly the Support Team. They assist the Forum Leaders in running the forums. With the recent retirement of the Forum Mentor team, the Forum Assistants will take on the role of PMing members about profile violations. Blog Leaders -- The blog leader is responsible for setting and enforcing blog policy. Blog Assistants -- They assist the Blog Leader in enforcing the rules in the blogs. Reporters (old color) -- They are responsible for posting news on the front page of the site. Reference Masters (disbanded 08/29/2012) -- Staff members in this group were in charge of the Reference Team on BZPower and led all reference projects on BZPower. Reference Keepers (disbanded 08/29/2012) -- This group assisted the Reference Masters in various reference projects. In the past, staff members could belong to more than one group; however, this is no longer done. Retired Staff (old color) - This new group was set up to honor those staff who have left in good standing. Retired staff who meet this criterion will be invited to join this group; in addition, current inactive staff are moved into this group, although they are always welcome back to their former position should they return. Retired staff have the same privileges as OBZPCs. See this topic for more information. To learn more about the various staff groups, visit the BZPower Staff Information topic. To see all staff, past and present, see the Official Staff History Topic. Outstanding BZPower Citizens -- They are members who have earned full Proto. See more here. Premier Members -- They are members that have contributed to BZPower by buying Premier Membership. See more here. Premier Members have their names bolded on the board index. Members -- The regular members of the site. Referred Members: These members have been referred by a friend on BZPower. Members joining the site through the Referral Program will have thirty days of Premier perks and will be able to participate in the New Member Raffles. Awaiting Authorization -- Those who have just registered and awaiting to be approved or are awaiting validation after an email change. Banned Members -- Members that are no longer welcome on this site. Banned members cannot view the board index, and as such are unable to post or PM. Please see this topic: Being Banned on BZPower. Suspended Members -- In the past, this group was used for members who were suspended from posting for a certain amount of time. However, the board now allows Forum Leaders and above to suspend posting privileges without requiring a change in member group; therefore, this group is no longer in use. Restricted Members -- This group has, in the past, been used for members who excessively advertised; members placed in it were no longer able to view profiles or send PMs. This group is currently empty, and it is not known if the administration will make use of it again. See more on BZPower's Advertising Policy here. Banned from B/S/T -- This is no longer a member group, but in the past, these members were not allowed to access B/S/T due to numerous poor trades. Banned From BBC -- This is no longer a member group, but in the past, these members were not allowed to access BBC due to poor behavior in that forum. Frowned Upon By Hapori Tohu -- Members who insult the heart of BZPower, Hapori Tohu. However, this group does not suffer any removed privileges. This group is most likely no longer used. You can see the members of each different staff and member groups by going to the Members List, selecting "More Search Options" (on the upper right hand side of the page), selecting the member group you wish to view, and completing the search. While viewing a topic, you will see a list of all members currently viewing that topic at the bottom of the page. Anonymous users have chosen to sign in anonymously; their names are not displayed on the forums. Names in italic are currently posting in that topic. Edited by -Windrider-, May 18 2016 - 06:21 PM. A Blog is a Web Log, or an online journal. It is a place where you can post whatever you feel like, provided you follow BZP's Rules and Guidelines, as well as the Blog Rules.To access BZPower's blog page, click on the "Blogs" tab under the banner on the board index, or simply click here. Only Premier Members can have Blogs. If you do not have a blog, go to the Manage Blogs section in your Control Panel. The procedure from there should be straightforward. When viewing the Blogs main page, you can click "Add Entry" on the right of the blog list. You can also add an entry while viewing your blog, and clicking "Add Entry" there. 1. "Entry Title": Fairly self-explanatory, you put the title of your blog entry here. 2. "Entry Tags": Any tags you want to place on your entry go here, separated by commas. When someone clicks on the tag, it will take them to a list of other topics/entries containing the same tag. 3. "Entry Image": You can upload an image file to display next to your entry text. 4. "Entry Album": You can select one of your albums from the BZPower Image Gallery to display with your entry. The images from the selected album will be displayed as thumbnail links to their gallery page. 5. "Publish": You can click "Save Draft", to save your entry as a draft version that only you can see. The "Publish Immediately (Change)" option can be used to bump blog entries, and will be discussed below. 6. "Entry Categories": You can use this option to file a blog entry under one or more categories. It works like tags, but only shows your entries under the same categories. You can edit categories on the Manage Blogs page. Bumping an entry is when you push a blog entry back to the top of the blog list. 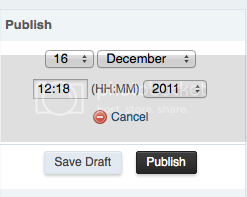 This is the screen shown when you click "Publish Immediately (Change)" link while adding or editing an entry. By changing the date shown, you can change when the entry will be published. By setting this to the current date and time and beyond, this can be used to bump an entry, or to put an entry on a delay update. Note that 24-hour time is used, so if you want the entry to be published at 8 PM, put "20:00" instead of "08:00." The "Publish" area is "stamped" with the date and time that corresponds to your first having loaded the "Add Entry" page and will not update to the current time upon your publishing the entry. You might have noticed, when publishing an entry that has taken you a while to type out, that your blog is not bumped to the top of the blog list. This is because, again, that the time of publication is set to when you first load the "Add Entry" page. Therefore, if you wish to guarantee that your entry will bump your blog to the top of the list, follow the procedure in the first paragraph of this section and change the field to match the current time before clicking "Publish." Blog Q&A -- all blog questions go here! Edited by -Windrider-, Feb 21 2015 - 03:42 PM. Viewing the calendar will allow you to know when a specific event will occur. In the past, the staff have used the calendar for contests and dates when spoiler restrictions were lifted. The calendar will also show all of the member birthdays that occur on a given day. Underneath the BZPower logo at the top left corner, you will see several tabs. There you will find the Calendar link. The numbers in red correspond to important aspects and features that will be covered below. 1. Month and Year: This is the month and year you are currently viewing. 2. "Previous/Next Month": These links will take you to the previous or next month. 3. "Jump to...": Clicking this will allow you to a month and year of your choosing. 4. "Follow this calendar": Not only can you follow topics, but you can also follow the calendar. This will allow you to receive any notifications on any updates to the calendar. 5. Add Events: As of July 25th, 2014, all members can add events to the calendar. Your event will have to be approved before it is shown. This will display events logged in the calendar within the next month, and the date on which it will occur. Clicking on an event will take you to its page in the calendar, where you can view additional details posted about it. Edited by -Windrider-, Feb 21 2015 - 03:43 PM. News reports are very important for BZPower, for only if enough members report news frequently can the site stay true to its commitment to keep you up-to-date on the latest LEGO news. This is the hottest news and includes everything that does not fit in another category. News posted with this label ranges from a press release by LEGO to a LEGO website update or to an interesting piece of recent LEGO trivia. In some exceptions, news can have this label despite not being directly related to LEGO. News with this label is of the kind that help you to let your pocket lose weight. It can range from sales on LEGO sets to news on the availability of new LEGO sets. Staff members can have their review of a new LEGO set on the front page. They are great for helping you decide if you should get a set or not. You cannot have your own reviews posted on the front page, but you can post them in one of the Set Discussion forums. If you see this label, you should probably pay attention. News is only posted in this category when the administration wants to send a message out to the membership, mostly important announcements regarding this website. This can range from a new Administrator or News Reporter being promoted, an Administrator stepping down, a new staff group being introduced, a contest or an announcement of an upcoming upgrade, update or downtime. News posted in this category is not actual news but rather is an interesting opinion, mostly by a News Reporter (or even an opinion published in mass media) about a recent controversial topic related to LEGO. These extremely rare news stories encourage discussion. These news stories announce important changes to the reference section of BZPower. This label is now out of use. You can browse news reports on the bottom of the front page and search them on the right. The News and Market categories are where you come in! Your reports are featured here. Just send an email to news@BZPower.com and make sure to include your display name (the one you see in the forums, not the one you log in with) in order to guarantee that you are listed as source. Of course no effort comes without a proper reward. If your reported news is posted on the front page listing you as a source, you may receive a Proto boost if it is considered important enough by News Manager Black Six. Usually you are given no feedback about a report. Your email did not reach the News Reporters. Check if you spelled the email address correctly, and if you did, PM a reporter and ask them if they got any of your recent emails. Your news was not considered worthy of posting. That's okay, everybody can misjudge something. (Even the News Reporters can!) Ask yourself when finding something new: How many fans would this news really interest? If you can't think of more than a small interest group, chances are it won't be posted. However, if the news you found is a true sensation, something totally unexpected or the information everybody on the site has been waiting for months, your chances are better. You reported something that is actually old. No need to worry; it is a common mistake. Your report was not detailed enough. And consequently, the News Reporters were not sure if what you told was indeed true. Make sure you always include links to credible sources or photos of your findings. Also, less is more. A short, but informative report is more likely to be featured than one that fills up the reporter's screen. Reporters are very busy people so they will enjoy more a report that's quick to read than one that takes long. Good grammar and spelling can also be significant. The News Reporters want to reserve your report for another day. It's possible other people reported more important news so the News Reporters preferred to keep your report for a slow news day. It's also possible too many members reported the same source. In that case, the source is listed as "BZPower Members" or "LEGO." "LEGO" is also used to tag press releases. Don't despair if after several reports you are still not listed as a source! Generally, it's best not to search crazily for news, but rather to know where to look. LEGO.com is a good source for news especially in the months of November to January and May to July, when websites are updated and added. Doing a Google News search (or somewhere else) of "LEGO" and other related key words can get you some good results, too. Just remember to report anything you come across that could be of interest to a larger number of members, even if it does not interest you too much, and eventually, you will be proud to find your name shining in a news report! Edited by -Windrider-, Apr 13 2016 - 07:10 PM. The BZPower Image Gallery was added as part of the site's 11th anniversary celebration. See the news story here. The feature allows members to upload images to a personal gallery for use in signatures, posts, etc., effectively using the site as an image host. First, let's explain the Global Albums. There are currently six: the Members Gallery, Bionicle-Based Creations, System-Based Creations, General Art, Comics, and Kits. Because these are Global Albums, anyone can upload an image to them or create a personal album inside one of them. Just note that personal albums inside the "themed" global albums, such as Comics, should not be used for random images. Use the Members Gallery root for those. From an Album's page, select "Upload" to begin the process of uploading an image to that album. This bypasses the album selection process that you would have to go through when choosing "Upload" from the main Gallery page. In order to create your own personal album, however, you will need to click on "Upload" on the main page. From then on, however, you can simply upload from your album's page and skip most of the below. From here, you will choose which root album your album will be a part of. You can click on any of the sub-Global Albums (Bionicle-Based Creations, General Art, etc.) to select one of them; you aren't limited to the three roots you see given here. You can then decide how you want your album to be organized, and whether or not you want your album to be public. Selecting "Friend Only Album" is not recommended - we're not going to stop you, but just don't think it will hide your images from the administration! All right, now hit "Save." Your new gallery is now created, and we can proceed to upload an image. Again, if you clicked "Upload" from an existing album, you can skip all of the above. "Title," "Tags," and "Description" should be familiar fields. The "Copyright" field might seem to be a silly little thing, but is indeed a good way to give credit where credit is due. Now, the "Cover Image" options. At the top, you'll see the current cover image for your album displayed as a thumbnail, if there is one available. Leave this checked to keep this as your cover image. Below the thumbnail for the image you are uploading, you will see another "Cover Image" checkbox - select this if you want your new image to serve as your album's front page. Select "Delete Image" only if you've changed your mind and don't want to upload after all! "Rotate Image" is self-explanatory. OK, you can now hit "Finish & Publish" to wrap up the upload process. "Report Image" will appear no matter whose image you are viewing; use this to report any content that violates BZPower's guidelines, including the image itself, any notes added to the image, or image details such as its description. "Image Moderation" allows you either to edit an image's details or delete it. will rotate the image to the right; will rotate it to the left. Type whatever you wish, and then click "Save" to set it. Keep in mind that content in these notes are subject to BZPower's Rules and Guidelines. You can only add notes to images you have uploaded. You can edit the details of your gallery at any time by selecting "Edit" from the right-hand options on your album's page. This includes the option of changing the parent album. Additional options are available from the "Options" drop-down menu when viewing an image's page, such as viewing the image in different sizes, generating links to the image in various formats (BBCode, page URL, image URL), viewing Exchangeable Image File Format (EXIF) data when available, and, if viewing something you have uploaded, the option to set the image as your personal photo/avatar. While following an album should notify you of new images uploaded to it, following an image appears to serve no purpose, since commenting is disabled.Currently, rating an album or an image seems not to work.The "My Media" button in the Rich Text Editor ( ) can be used to insert a sort of fancy link to your album or images. Select either "Gallery Images" or "Gallery Albums" from the tabs on the left to make your selection. Hit "finished" when you have added the desired items. An example of how the code will visualize itself in a post/blog entry/PM can be seen below. The Tracker is BZPower's newest feature, allowing members to open tickets about any technical problems encountered on the site or about suggestions for improvements to BZPower. Tickets can then be discussed within their individual pages; in addition, members will be able to use a feature allowing them to confirm or support the issue or suggestion. Ultimately, this will help the staff to keep track of what is a priority on the site, and will allow members to have a more direct relationship with the staff when it comes to site improvements. To start things off here, I would like to discuss when to use the Tracker before tackling the question of how. For a general FAQ, you may find this news post useful, but I will go into more depth here. The Tracker will not be replacing any of BZPower's existing features or forums. That said, it will be the new home of a few kinds of reports. Use the Tracker to report software bugs and technical issues. If you are experiencing a technical problem on BZPower (example: rich text editor not working), then you should use the Tracker to open a ticket about it. Members will then be able to say if they can reproduce the problem or not, and it will get brought to the attention of the administration more quickly. Note that before this feature was implemented, bug "reports" were posed here in the Q&A forum as questions, but no longer. Also note that you should open an "Issue" ticket when reporting bugs. There will be more on "Issue" and "Suggestion" tickets later. Use the Tracker to offer suggestions for BZPower. If you think BZPower could use a new feature, then go ahead and open up a "Suggestion" ticket in the Tracker. Members will then be able to support the proposal and discuss it as well as receive feedback from the staff. Before this feature was implemented, all suggestions for BZPower were PMed to Black Six, but the Tracker will now replace the scary task of sending my boss a message. Do not use the Tracker to report BZPower content. This is what the report system is for; as stated earlier, the Tracker will not be replacing any existing BZPower features. Were the Tracker used for reports, it would get clogged up fairly quickly. Moreover, the report system is designed to be much more efficient for its intended purpose than any tracker could be. So, continue to hit that "Report" button. Do not use the Tracker for general questions. While bug reports will no longer be posted here in the Q&A forum, all other BZPower-related questions will still belong here. The reason why is because, well, that's the nature of a tracker! It is meant for technical support, mostly. This will also help to keep the Tracker organized and not overgrown with tickets so that the more important issues can be visible. Do not use the Tracker for forum-specific suggestions. Let me explain: say you want a rule changed in, oh, Bionicle-Based Creations. It is tempting to think that such a request is a suggestion that a ticket should be opened. This is not the case, however; in this example, you would still PM a Forum Leader of BBC or whichever forum is in question. The Tracker is for suggestions that pertain to the forums, blogs, etc. as a whole. In addition, things such as member-related complaints should not be posted in the Tracker; those should be handled by addressing the member or the staff privately, over PM. And, of course, the Tracker should not be used as general forum; related discussion is welcome within the tickets, but spam and chatting is not. Head here. Select the appropriate Project. Note that Issues and Suggestions now have their own separate projects. Also keep in mind the sub-categories (Forums, Blogs, Gallery) for specific issues within the Community. Then, click the "Start New Issue" button. "Issue Title" and "Issue Tags": Familiar fields! Enter the appropriate information; be sure to be specific. Issue Type": This is important! Once you post a ticket, you cannot change this field. Issues are bugs and technical problems that you experience on the site. Suggestions are, well, suggestions for improvements to BZPower. These should go in the Suggestions projects. "Issue Information": Each ticket posted will have a "New" status until it is accepted by the staff. "Severity" will also be determined by the staff. "Issue Visibility" cannot be changed.Once you have filled out all of the necessary information, click "Post New Issue" at the bottom of the page.When viewing a ticket, you will see the following on the right-hand side of the page, depending on what type of ticket it is. "Issue ID" is simply the ticket's number. "Issue Type" is either "Issue" or "Suggestion" as chosen by the member in the process of creating the ticket. "Status" and "Severity" will be changed by the staff. What is important here is the "Issue Confirmations" section. This shows, for an "Issue" ticket, how many people are experiencing the same problem/can reproduce the issue. The number in parentheses corresponds to how many members have clicked "YES" or "NO." Please utilize this feature! Click on "YES" if you are experiencing the described problem; click on "NO" if you cannot reproduce it. This will help the administration to determine the priority of issues on BZPower. Click on the thumbs-up to show your support for the suggestion; click on the thumbs-down if you do not like it. This is simply a "like/dislike" system. This will, like the "Issue Confirmations" on an issue ticket, help the administration to determine priority. When posting a ticket or adding to the discussion in one, please be sure to follow BZPower's guidelines, no matter what. Perhaps most importantly, do not bypass the word filter, even when discussing the issue. Do not flame - if you have a complaint, please word it respectfully. This Tracker is not in place to bash BZPower policies and features; it is there for constructive suggestions. The BZPower staff are all volunteers, and real life and other priorities come first. I feel the Tracker will help us focus our energy on the things you guys want to see the most, so we can get those things done first. Edited by -Windrider-, Feb 21 2015 - 03:48 PM. In the creation of this compendium, as much an effort as possible has been made to present the most current information about BZPower's new forums. It is my hope that this topic will answer all basic questions about the site, its rules, and its structure. That said, it is not perfect. As such, if you feel that important information is missing, please PM me with your proposal. All other suggestions for this topic, functional, aesthetic, or otherwise, should be PMed to me as well. Allow me to restate that all suggestions for BZPower should be made in the Tracker. Than the Moa -- For his hard work on the old Compendium, which served as a template for this one, and for preliminary work here. Velox -- For authoring the Forum Layout and Member Groups sections. Zeddy -- For authoring the Common Negatives section. Eeko -- For authoring the Blogs section. Erebus -- For authoring the Calendar section. Gatanui -- For authoring the News Reports section. Ziko -- For authoring the Control Panel section. Really big thanks to all of you. I mean it! It has been a month of hard work, but I am very proud of the result. You are the best! I am totally dedicating this topic to Polo X, respected global moderator and original Q&A Guru. We miss you! Thank you for reading, and we are looking forward to answering your questions. Edited by -Windrider-, Oct 15 2015 - 08:11 PM.